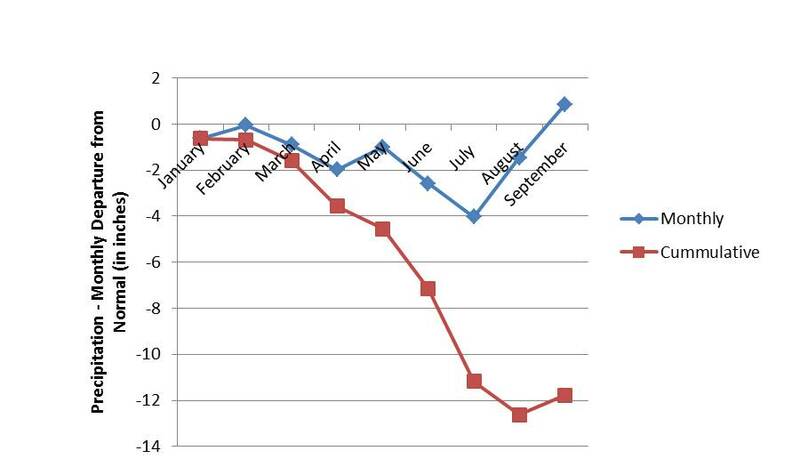 September was the first month in 2012 to have had above normal precipitation (Table). Of the 4.6 inches received in September at the NWIARDC, 3 inches came in the first few days of the month with the remnants of Hurricane Isaac. Although 0.9 inches more rain fell in September than the normal, the NWIARDC is still running a deficit of 11.77 inches for the year (Figure). 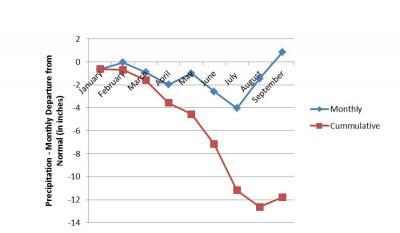 Monthly average air temperatures hovered near normal, with the average high 1 degree above normal and the average low 2 degrees below normal (Table). Temperatures have not yet been below freezing at the research center, which is evidenced by both the observed low of 33 degrees and the oat cover crop remaining unblemished by frost. On October 1, the USDA-NASS and Illinois Department of Agriculture released the, "Illinois Weather & Crops" report for the week ending September 30, 2012. This report summarizes regional and state-wide soil moisture levels. With the late summer rains that six of the nine crop reporting districts received from Hurricane Isaac, topsoil moisture levels have rebounded somewhat since mid-summer. State-wide, 15 percent, 37 percent, 44 percent and 4 percent of the state has topsoil moisture levels that are very short, short, adequate, and in surplus, respectively. Unfortunately there has not been enough rain to recharge the drought-depleted subsoil moisture levels for the majority of the state. State-wide, 34 percent, 44 percent 21 percent and 1 percent of the land area has very short, short, adequate and surplus subsoil moisture levels, respectively. In the Western Illinois Crop Reporting District, 22 percent of the region's topsoil is very short, 43 percent is short and only 35 percent has adequate topsoil moisture levels. Subsoil moisture levels in Western Illinois are worse than the state-wide average, with 53 percent very short, 33 percent short and only 14% of the region with adequate moisture levels. As corn harvest speeds to a close, folks may still be concerned about crop conditions for both soybeans and pasture land. For both soybeans and pasture, some lucky folks must be pleased to have the 2 percent and 20 percent of the crop in excellent and good condition, respectively. For soybeans, 37 percent of the crop is in fair condition, 24 percent in poor and 17 percent in very poor condition. For pasture, 39 percent of the crop is in fair condition, 22 percent in poor and 17 percent in very poor condition. Corn - Corn harvest has progressed at lightning speed in Illinois, with 71 percent of the crop harvested by September 30. Harvest has progressed much faster than in years past; in 2011 only 29 percent of the crop harvested by this time and only 33 percent of the crop had been harvested by this time in the 5-year-average (Figure). 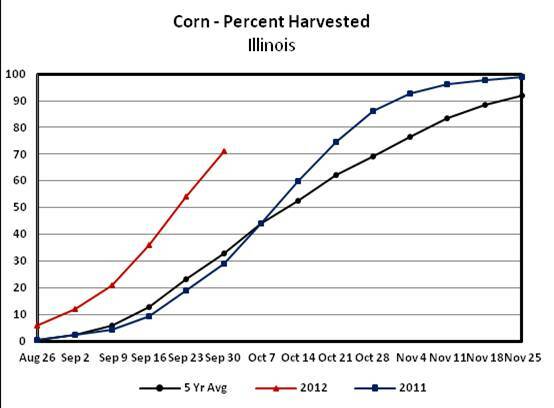 In Western Illinois, 97 percent of the corn crop has reached maturity and 77 percent of harvest is complete. At the NWIARDC, all corn in bulk and experimental fields except those plots planted last in the planting date study (May 30) have been harvested. Soybean – Statewide, 98 percent of soybeans have started turning yellow, 85 percent have begun dropping leaves and 22 percent have been harvested. Harvest progress is further along than at this time last year when 10 percent of the crop had been harvested. In Western Illinois, 98 percent of the soybean crop has begun turning yellow, 90 percent is dropping leaves and 22 percent has been harvested. At the NWIARDC, very few soybean plots, except some plots with early maturity group IIs have been harvested.